The 2018 Social Security Trustees Report is out, weighing in at a somewhat-intimidating 270 pages (!). But if you don’t want to wade through it, here’s the bottom line on Social Security’s bottom line: it’s in good shape – and with a few legislative changes, could be even better. A large (and still growing) surplus means Social Security is fully funded for at least the next decade-and-a-half. The Social Security Trust Fund balance stood at $2.89 trillion at the close of 2017, with an annual surplus of $44.1 billion. The program can pay all benefits to beneficiaries, as well as associated administrative costs, for the next 16 years – and with no changes, 79 percent of all program costs after 2034. It’s important to remember that Social Security will keep on paying benefits even if the Trust Fund is depleted – and there’s a pretty straightforward way for Congress to avoid any reduction in future benefits for today’s younger workers: Social Security can fully pay all scheduled benefits for the foreseeable future if Congress ensures the wealthy pay their fair share. Currently, workers and their employers each pay 6.2 percent of wages toward Social Security – but there’s a cap: high-earners don’t pay anything on wages over $128,400. According to a recent report from the Congressional Research Service, Congress could extend the Trust Fund’s surplus until 2087 by simply scrapping that cap, so the wealthy pay Social Security taxes on all of their income – like the rest of Americans already do! If those facts come as a surprise, you may be one of the millions of Americans who have been subjected to a relentless campaign to convince them Social Security is in crisis and won’t be there when they retire. But nothing could be further from the truth. 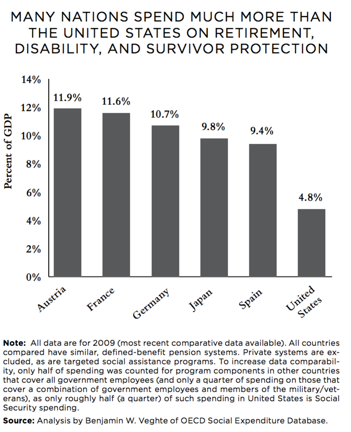 Social Security is not only the largest, best-known and most efficient retirement, survivors, and disability insurance program in America’s history; it is also the nation’s most secure and conservatively invested public trust. What’s more: Social Security doesn’t just work – it works well! In Washington, nearly 1.3 million state residents of all ages receive Social Security benefits. That’s 18 percent of our state’s population who in turn provide income for 30 percent of the state’s households. Social Security is a remarkably effective anti-poverty program: Social Security dramatically reduces poverty among the elderly in Washington, from 35.1 to 7.4 percent. Retirement benefits are modest, averaging $1,379/month ($16,549/year) – but without them, an additional 301,000 Washingtonians age 65 or older would have lived in poverty in 2015. Social Security protects children and families against tragedy: For 98 percent of Washington’s more than 1.6 million children and families, Social Security is the primary insurance protection in the event a parent or spouse dies or is disabled. In 2016, over 109,000 widow(er)s and children in Washington received an average $1,219/month ($14,631/year); over 211,000 disabled workers and their families received an average $1,061/month ($12,737/year). Social Security bolsters local economies across the state: In 2016, Social Security benefits were equivalent to 5.2 percent of Washington’s total personal income, and generated more than $31 billion in economic activity, 192,000 jobs and $1.5 billion in state and local tax revenue. In December of that year, nearly $1.7 billion in Social Security benefits went directly to local economies across the state, from King County (288,000 people, $406 million) to Garfield County (660 people, $808,000). Social Security does this in every state across the nation. So why is an entire political party and its leaders dedicated to pulling the economic rug out from under millions of Americans? To trade Social Security for more tax cuts to benefit the super-wealthy. Don’t let anyone tell you we can’t “afford” Social Security: in 2018, Social Security payments will be just 4.9 percent of the nation’s gross domestic product (GDP). Even when future benefits are at their highest (the year 2095!) it will constitute just 6 percent of GDP – considerably less than other industrialized nations spend on equivalent programs. Reducing Social Security benefits, limiting cost-of-living-adjustments (COLAs) and/or increasing the retirement age will diminish economic security for nearly every American. It would disproportionately affect low- and middle-income families, women and all workers of color who, unlike wealthy individuals, often do not have significant retirement savings and work in more difficult and physically demanding jobs. Raising benefits overall: Adjusting the benefit formula to raise benefits for those who have had careers in low-wage occupations – such as childcare, restaurant service, or home health care. This would better protect the financial security of people just scraping by. Protecting the very elderly: Living to extreme old age, outliving a spouse or not having a spouse greatly increases the risk of poverty. “Bump-ups” in benefits for seniors living past a certain age and increasing benefits for single elderly people would help reduce financial insecurity. Honoring time caring for family: Caring for children or aging family members can cause many people, especially women, to reduce their hours or stop working, greatly affecting their retirement benefits. Reducing the number of years’ earnings used to calculate retirement benefits from 35 to 30 can eliminate this caregiving penalty. It would also help Millennials and others who have had reduced access to employment in economic downturns and those who’ve suffered the brunt of racist mass incarceration policies. Restoring student survivor benefits: Before 1981, children of retired, deceased, or disabled workers continued receiving benefits through age 22 if they attended college. Now benefits end once a young person turns 18 and finishes high school. Reinstating college benefits could help children and their families achieve their dreams and reduce socioeconomic barriers to lifetime opportunities. Adopting the CPI-E inflation index: Over the past eight years, the current COLA formula has led to average monthly benefit increases of just over 1 percent per year. Costs for Medicare and other essentials are rising faster than that. Adopting the Consumer Price Index for the Elderly, or CPI-E, would be a more accurate means of calculating adequate Social Security COLAs. Restoring office access & services: The Social Security Administration’s (SSA) expenses are self-funded and account for less than one penny of every dollar spent. While demand for SSA services (and staff workloads) have risen to record highs, over the past six years, the SSA’s operating budget has shrunk by 10 percent (after adjusting for inflation) due to Congressional budget cuts. This has resulted in the closure of one field office and the loss of 776 employees in Washington. Restoring full funding would help ensure people have dependable and easily accessible in-person service at Social Security offices. Take a minute to get in touch with your elected representatives in the House and Senate – no matter their political stripes – to remind them that Social Security is important to you and your community, and to encourage them to sign on to legislation that will expand and improve Social Security.